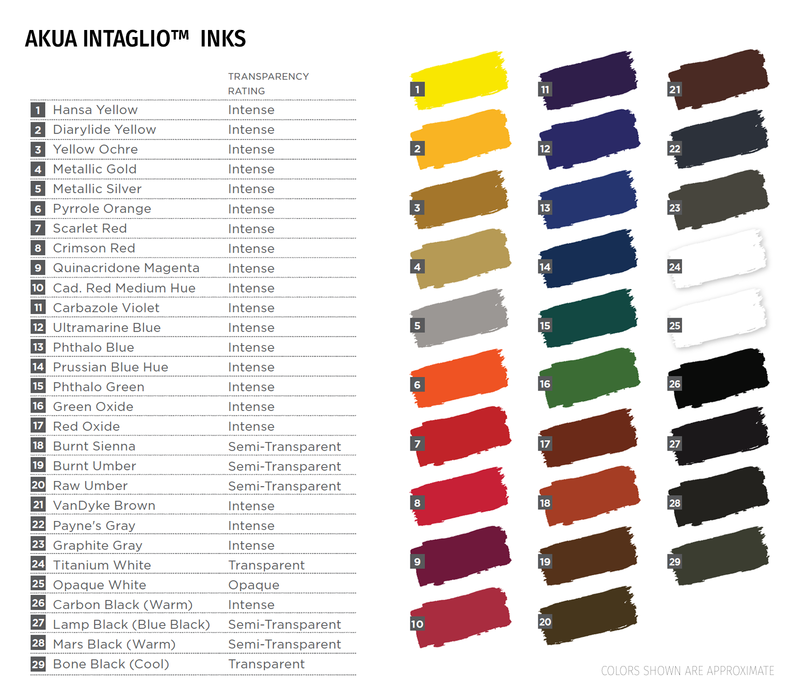 Akua Intaglio Inks deliver brilliant colors, intense blacks and unmatched working properties. They dry through absorption-they will not dry on the printmaking plate-and clean up easily with soap and water. These inks are ideal for Intaglio/Etching, Monotype, Gel Printing, and Collagraph printmaking and can be used with Akua Liquid Pigment® and select Akua Modifiers. All Akua Intaglio colors carry the AP Seal. Looking for some creative inspiration on how to incorporate Akua Intaglio into your creative process? Select from the links below to view step-by-step instructional videos or visit our Akua Gallery to see a range of finished works. What is the difference between water-based and water-soluble ink? The term “water-soluble” is used to describe substances that dissolve in water. The term “water-based” implies that water is among the ingredients in the inks' formulation. Are Akua Inks water-based or water-soluble? Akua Intaglio Ink is NOT water-soluble. The Intaglio process requires printing on damp paper. If the ink were soluble, then it would not hold up to the challenge of printing on damp paper. A non-water-soluble ink will offer a sharper image. If you were to mix water into Akua Intaglio ink, it would not dissolve, it would stiffen up. Soap is necessary to dissolve Akua Intaglio Ink. Akua Liquid Pigment IS water-soluble. It prints best on dry paper and cleans up with just water. However, small amounts of Akua Liquid Pigment added into Akua Intaglio Inks or Akua Transparent Base would eliminate Liquid Pigment’s water-solubility. Both Akua Intaglio and Akua Liquid Pigment have water among their bases' ingredients. What are the advantages of Akua Inks? Akua Inks are high-quality, pigmented inks. They offer the artist the opportunity to work in a safer, fume-free studio without sacrificing the quality of their methods and materials. Akua Inks clean up quickly and easily with soap and water, not hazardous solvents. The ink never hardens or skins, meaning you don’t waste ink and no longer have to use hazardous anti-skin sprays. Akua Inks will not dry on a non-absorbent surface, meaning you never have to clean your palette or worry about damaging tools or plates with dried ink. The fact that Akua Ink doesn’t dry on the slab eliminates the need to clean up right away. What are the differences between the working qualities and appearance of prints made with Akua Intaglio and oil-based ink? Working with Akua Intaglio Ink is very similar to working with oil-based ink. While the tack and viscosity might initially feel different, the only real change that needs to be made in the studio is the replacement of the solvent can with a bottle of diluted dish soap for cleanup. All other methods and materials remain the same. Additionally, Akua Intaglio Inks make the entire process of wiping the intaglio plate much more efficient and require much less effort and time than oil-based ink. In most situations, prints made with Akua Intaglio Ink look identical to prints made with oil-based ink. 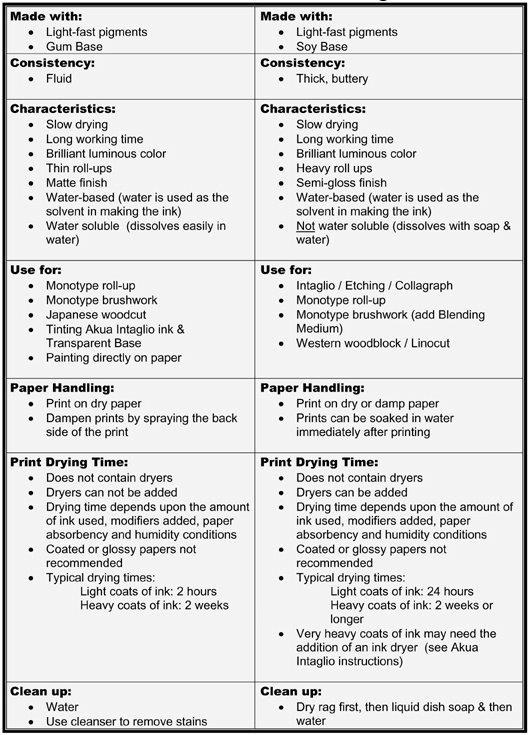 Click here to see the Akua Inks Comparison Chart. Before Printing: Add Magnesium Carbonate (for Akua Intaglio Ink)--Mix 10% of Magnesium Carbonate into Akua Intaglio Ink. Note: Magnesium Carbonate will cause Akua Intaglio to stiffen when left out overnight. After Printing: Dry prints between blotters (for Akua Intaglio or Akua Liquid Pigment Inks)--Blotters are highly-absorbent papers. When storing, be sure to face the print up on a blotter paper. If needed, add another blotter paper on top and change the blotter as needed. Newsprint paper can be used as an inexpensive alternative and works well for blotting and storing prints while drying. If ink offsets onto the Newsprint paper, sprinkle a small amount of baby powder onto the Newsprint paper to dry the offset ink on the Newsprint. Be sure to dust off the excess powder before using the Newsprint again. Are Akua Inks compatible with Gel Printing Plates? Speedball® Gel Printing Plates were specially-formulated for use with printmaking inks, and are ideally-suited for use with Akua Intaglio and Akua Liquid Pigment Inks. Akua Intaglio Inks are also compatible with other brands of gel printing plates, but cannot be used with homemade gelatin plates as these plates will resist the ink due to the soy base. Akua Liquid Pigment Inks may be used both with competitive gel printing plates and homemade gelatin plates. Oily blooms/halos are appearing on my paper after printing. What is causing this? The interaction between ink and paper may be the cause of this issue and/or the ink application for the print is too heavy. Thin, Japanese-type papers may be particularly susceptible to this. Akua Liquid Pigment is recommended for use with these types of papers due to its binder type. Depending on the specific process utilized, Akua Liquid Pigment may be used directly from the bottle or mixed with wheat paste or methylcellulose (the amount of each depends on desired color, paper used and the environment’s humidity). Adding wheat paste or methylcellulose to Akua Liquid Pigment will make the ink dry more quickly. If a greater open time is needed, simply add Akua Retarder to the ink (Akua Retarder for use with Akua Liquid Pigment only). The ink needs to be more thoroughly stirred in the jar before using. The paper/ink interaction is not ideal. Try another type of paper. The paper may be too wet (soak less, blot more). The plate may be over-wiped (try using an inky Akua Wiping Fabric) . The color selected may be too intense by nature. Add Akua Transparent Base to the ink to reduce the color's intensity. The ink/paper interaction may not be ideal. Try different papers. How do I keep the ink from wiping out from incised lines? This will often occur when the ink is too loose. Akua Mag Mix or Calcium Carbonate can be added to stiffen the ink. Do a final wipe with clean Akua Wiping Fabric. Lightly coat wiping cloth with Magnesium Carbonate. Clean selected areas with cotton swabs. Dampen the paper more evenly. Avoid touching the inked surface of the plate and transferring fingerprints. The ink I just purchased is runnier/thicker than the Akua Intaglio inks that I’ve used in the past. Do I have a bad batch? The viscosity of Akua Intaglio Inks vary naturally across colors and can be easily modified to the desired viscosity. To stiffen the ink, Akua Mag Mix or Magnesium Carbonate can be added. To loosen, Akua Blending Medium can be added to the ink. My ink arrived separated/has separated over time. Is it a bad batch? No. Akua Intaglio's unique formulation includes natural ingredients and the highest quality pigments. This combination can lead to some separation after manufacture/between uses (especially with whites or metallics), but will not compromise the superior performance on the plate or when printing. Click here to watch our video on Akua Intaglio Ink separation. When will the print be dry enough to frame under glass? As long as the print is not touching the glass, the print can be framed under glass almost immediately. Unlike traditional oil-based inks, Akua Inks dry by absorption, not evaporation; therefore, they will not leave a “film” on the glass as they dry. If the glass will be touching the print, let the print dry for at least 24-48 hrs. It is recommended to lay a piece of Newsprint on top of your print as it dries (with something heavy on top of it, like a book, if possible) to help pull up any residual ink that was left sitting on the surface. Residual ink left on the surface will not dry, as it was unable to fully absorb into the paper. This happens when one applies too much ink. Where can I find information regarding the specific pigments used in the individual colors? Specific pigment information can be found by clicking here. Can I print on fabrics using Akua Inks? Printing on fabric with Akua Inks can be done, but must be experimental as we do not have any formal testing for this specific process. Akua Inks do stain, although they do not contain dyes, so they cannot be treated as a dye. The inks will not be permanent on fabrics, and should not be used on projects that will be handled often or washed. Additionally, the inks cannot be heat set to make permanent. Can I use a sealer after printing with Akua Inks? If you are extremely concerned with rub-off and are comfortable with using spray fixative, a clear, acrylic spray gloss can be used with Akua Inks. To adequately “seal” your print, apply approximately three very thin coats of spray gloss. It is not recommended to use a matte or satin finish spray fixative, as it will alter the appearance of the inks’ color. Can I use Akua Inks for letterpress? Akua Intaglio Inks can be used for letterpress printing. Since letterpress typically requires a stiff ink (barely able to fall off of the ink knife), though, it is likely the Akua Intaglio will need to be stiffened. To do this, mix equal parts Akua Mag Mix with powdered Magnesium Carbonate. Next, add this mixture into the ink. Use small amounts of the mixture and continue to add until the desired thickness is achieved. Please note that ink containing Magnesium Carbonate will get thicker the longer it sits. Ink that has been mixed will Magnesium Carbonate will reach maximum thickness in 12 to 24 hours. Thoroughly blot the paper or colander it by running the paper through the press (wringing it out) before printing. My Soft Rubber Brayer has gotten sticky. What can I do? Good news! A sticky brayer isn’t rendered unusable. Simply roll your brayer through a light amount of corn starch or talc powder between uses. You do not need to rinse the brayers after the corn starch or powder has been applied as it will not impact the ink’s performance in future uses.